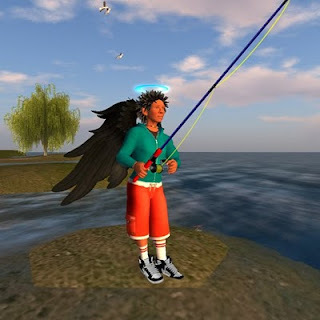 Part Five of Gemma Cleanslate's "The Kids of Second Life"
I decided when I joined Second Life, that I wanted two things for my avatar: to be an angel named Pygar, and to be a kid. My name and appearance are directly influenced by the movie Barbarella, but the kid part is more of an ideal way of being in the world for me. I also have a family here. My sisters Mari and Robin are very special to me, and we are Real-Life friends as well. Our parents also became friends of ours through our shared experiences in SL, though we have never met them in person. My imagination has led me to building objects in SL. I make toys to sell in my store, and have built some other things for Livingtree island, Burning Life, and just for fun. I made some of the things in this exhibit! Well, hopefully that gives you some insight into my childhood here. Thanks for reading!